If I had to pick one quartz movement that pretty much does it all and has stood the test of time, the ETA 988.432 would be the one. We’ve seen this movement for years (probably not like above) in the Breitling Aerospace, some Tags, and as well as a slew of other companies that have used it or a variation. It is solid, ultra functional, and a great seller. It’s my pick for any one-watch guy that prefers quartz and multi-fuction operations. If a second time zone is important, or a chronograph is a must, the ETA caliber 988.432 offers all of this. Not to mention countdown timer, day-date, and more. 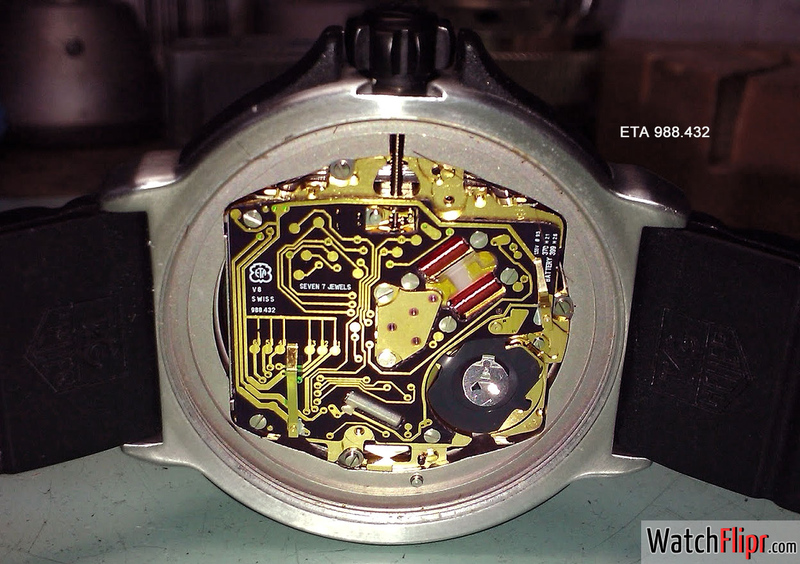 You can pay as little as a thousand bucks for a watch with this movement and work up to about 5k with special casing. Have a version in your collection. ← Previous Previous post: Video: Audemars Piguet Royal Oak… Congrats on 40!